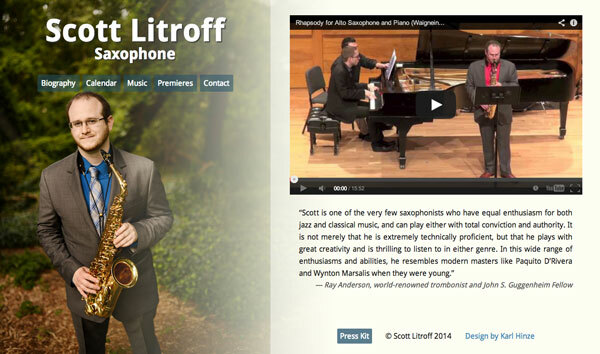 The Challenge: This new-music and jazz saxophonist and educator wanted a professional, elegant site to house his myriad of musical activities. The Solution: Using one of Scott's new headshots as a persistent layout image, I designed a responsive layout that would incorporate the image while still leaving plenty of space for content on any browser size. This design also uses Matthew Fries's Gig Calendar plugin and new features of WordPress (like native audio support), making it even easier to keep up-to-date.